"The leading causes of cat skin disorders include parasites, infection, tumors and allergy. Most cases are caused by fleas, even when none are found on the cat's body. Inhaled allergens are the second leading cause such as tree and grass pollen. Cats that are on a flea preventative should first be tested for atopy. Other conditions that are less common, but possible as a third leading cause is Ringworm. 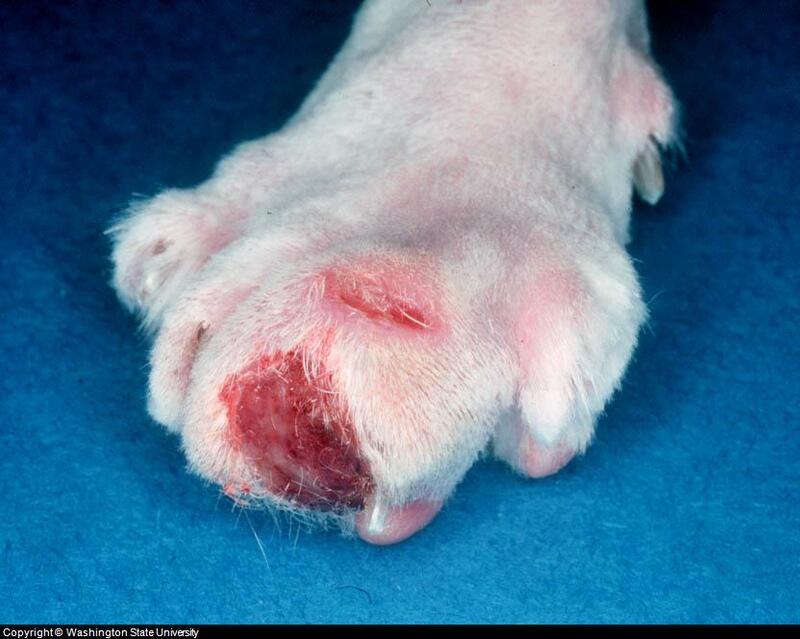 Diagnosis is based on a veterinarian taking a skin scraping, blood test or intradermal skin test. Treatment is specific to the underlying cause including the use of lime-sulfur dips for fungal infection and mites (mange), and prescription mediations formulated for to reduce symptoms such as itch." Cat skin disorders are tricky to diagnose. Your veterinarian will look at four factors in making an initial determination. By a mile, the most common cat skin problem is fleas (referred to as flea allergy dermatitis). It is tricky to diagnose in cats since there is a wide variety of symptoms. Adding to the difficulty is a tendency by cats to scratch any itch with the tongue and teeth. This behavior is often confused with grooming, when in fact it is a reaction to a cat skin itch. Cats will also lick affected areas causing the fur to fall out. In the case of fleas, cat hair loss often occurs on the belly, and the spine leading from the rear of the cat up to the shoulder. It can also cause scabs and lesions under the head and neck, forming a pattern referred to by Veterinarians as miliary dermatitis. After fleas, atopic dermatitis or inhaled allergens are the next leading cause of cat skin disorders. These also look like a cat flea problem. If you use a flea preventative with your cat, then allergy is probably the cause. One indicator of an underlying cause for a cat skin disorder is the location or locations of any disorder. Problems in one location are referred to as being localized, whereas problems all over a cats body are generalized. Scabies (mange), atopy (skin allergy), food reaction, allergy, inflammation of the blood vessel caused by a virus, bacteria or fungus (vasculitis), or pemphigus (problem with the immune system where the body attacks proteins in the skin which produces clusters of bullea which look like pimples. Mange (demodicosis), atopy (skin allergy), food reaction, fungal infection, insect allergy (fleas, flies, mosquitoes). Head shaking can indicate cat ear mites. As mentioned above, flea bites are the leading cause of cat skin disorders. While many cats will carry fleas but show no symptoms, others suffer from problems such as hair loss along the spine to the rump. It can also lead to a pattern of scabs and lesions under the head and neck which is referred to and dermatitis. Fleas can easily enter the home on the clothing of people, so don't be surprised that an indoor cat in a clean household is suffering from fleas. To treat fleas, follow the advice of your veterinarian. There are also herbal flea dips available for home treatment. This is followed by a thorough cleaning of the home and if recommended by a veterinarian, a flea preventative. 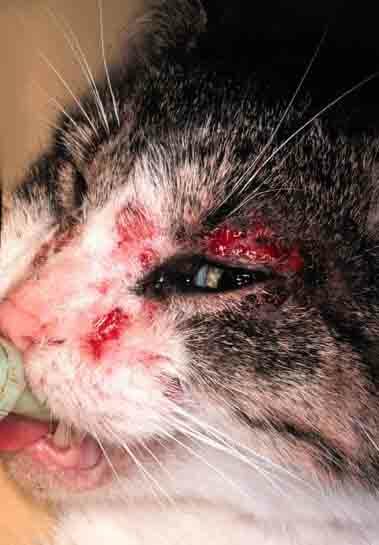 The second most common cause of a cat skin problem is atopic dermatitis or inhaled allergy such as pollen from plants, trees, grass and weeds. House dust and mold can also cause the problem. Veterinarian's are able to test for atopy using two different types of cat skin tests, including blood tests and intradermal skin tests. Typical cat atopy symptoms include skin itch with a rash or without a rash. Symptoms can start to appear between age 1 to 3 years. Cat skin allergies cannot be cured, but can be controlled with medications or avoidance of the cause. This condition is caused by Is a contagious disease caused by mites. Cats are infected by coming in contact with another animal. Mites cause severe itching in the affected areas. Types of mites that cause cat skin disorders include Cheyletiella that cause a condition called “Walking Dandruff” and Chiggers or (harvest mites). Chiggers appear in certain seasons such as the summer and autumn. Signs of scabies include the formation of skin problems at the face, ears and neck. Since diagnosis of this condition is difficult, treatment is started and if effective, a diagnosis of scabies is made. 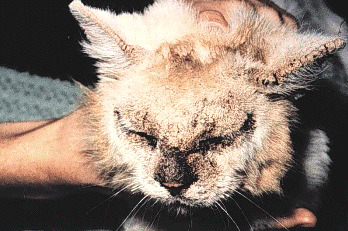 Treatment for cat mange involves either a prescription dip such as a Paramite dip (an organophosphate) or Mitaban dip (Amitraz). Treatment takes from 1 to 6 months. A natural alternative to research is Naturasil for Pet Mange It does not require a prescription, is all natural and can be equally effective. It has an added advantage of mixing with your cats shampoo, so that it will be more familiar to the cat during treatment. It also important to disinfect the home with a product formulated to kill mites. One option to review is Benzarid. Also wash all of a cats belongings with a liquid detergent and vacuum your home thoroughly. Ear mites (Otodectes cynotis) are a common cat skin condition. Mites can live in your home or outdoors from 8 to 12 weeks. Kittens can contract the condition from the mother. This condition is very serious as mites can move deep into the ear canal, causing an uncomfortable condition for the cat. If you cat has a cat skin disorder caused by mites you will see areas of the ear that are very irritated and a have thick reddish brown crust. Symptoms include itching of the ear, ear scratching and head shaking. Inside the ear, you may notice a bad odor and what looks like coffee grounds. There will also be some type of ear discharge that is brown in color and has a wax consistency. A veterinarian tests for ear mites by removing some of the wax from the ear for examination. The mites are small white specs about the size of a pin head. There are other conditions which are similar to cat ear mites, so be sure to see a veterinarian for a specific diagnosis. Treatment starts with cat ear cleaning using a product such as Epi-Otic. You can also make a home cat car cleaning solution using a solution of 3 drops white vinegar to 1 ounce water). Several drops of warmed olive oil and mineral oil can also be used to clean cat ears. Do not insert anything into the ear or use a cotton swab, since this can force discharge deeper into the ear. Place several drops into the external part of the ear canal. Massage the base of the ear, which will help any debris break fee. Wipe any discharge with a cotton ball. After cat ear cleaning, you veterinarian will prescribe a medication that is formulated to kill mites (mitacide). These include products such as Mitaclear. Other products used to kill ear mites includes Revolution for cats (selamectin). If you cat has Demodex cati mites, as described above for cat scabies, then a lime-sulfur dip such as Naturasil is used. It is rare for cat ear mites to infect people. Ringworm in cats will cause round hairless areas in one or multiple places on your cat's body. The skin lesions are round with embossed edges; they appear as patches on the skin giving the impression of the hair having been shaved. It is also called fungal dermatitis and is caused by a fungus not a worm. It gets it's name from ringworm because of the shape of the skin disorder. Treatment options include an anti-fungal cream or prescription drugs such as griseofulvin, ketoconazole. Note that ketoconazole may have negative side effects, particularly causing problems with the liver. Treatments place directly on the skin sometimes do not work since your cat will be compelled to try and lick off anything that is applied. Preferred methods of treatment are lime surfer and shampoos with the ingredient miconazole. One all natural sulfur and shampoo treatment worth researching is offered by Naturasil for Ringworm. We like the Naturasil approach since the lime sulfur treatment is mixed with either your cat's current shampoo or the shampoo offered by the company. This way the treatment feels familiar to your cat. Fungal cat skin disorders could go away without treatment, although treatment will help quicken the time to recovery, particularly if you have a long hair cat. If you see a single lump of bump that is growing then your cat can have a tumor or a cyst. Cats are prone to malignancy which means that the tumor is a neoplasm or mass of cells that is growing in an abnormal way. Your veterinarian will take a sample of the tumor called a biopsy for examination in a laboratory to diagnose these types of cat skin disorders. If you see a discoloring on your cats nose, ear or toe then it could be a type of tumor called a squamous cell carcinoma. White cats are particularly susceptible since this condition is usually a result to too much sun exposure. Your veterinarian will take a skin sample in order to determine the exact cause of the cat skin disorders. Surgery is used to removed the area being analyzed. There are three types of granulomas seen in cats, eosinophilic ulcers, Eosinophilic plaques and linear granulomas. All or one type can appear on the same cat. Diagnosis is based on blood tests and a biopsy. A veterinarian will look for causes such as allergy or infection. Treatment will be based on the diagnosis. Cat eosinophilic plaque usually occurs on the inside of the thighs and the abdomen. It is characterized by chronic itch which occurs before the appearance of red raised lesions. Your cat may be tempted to lick the sore red areas. Over time the lesions ulcerate. Cat eosinophilic plaque is usually seen in younger cats. Eosinophilic ulcers are referred to as cat lip ulcers. They usually are seen on a cat's upper lip, and on females. These types of cat ulcers can also be found on the foot and mouth. 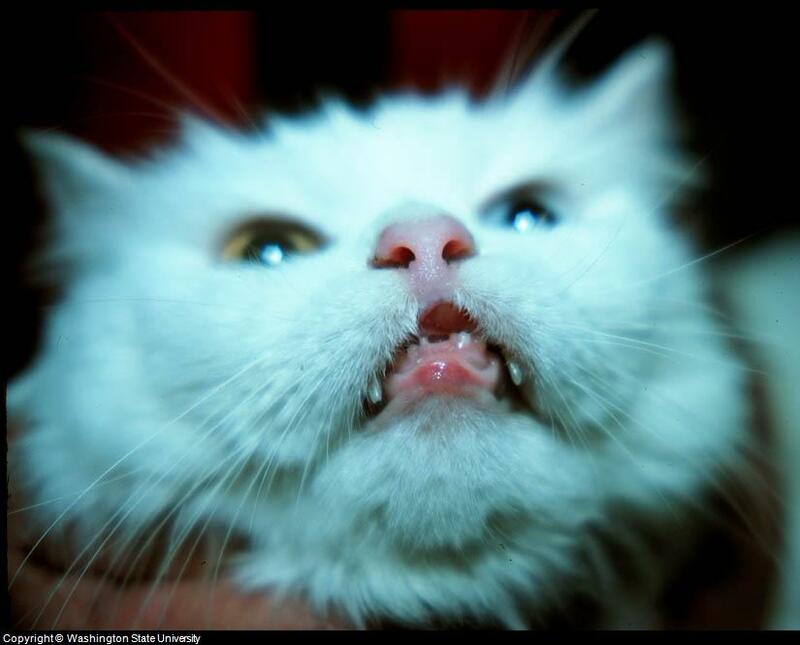 The ulcer can eat away at the tissue, causing the cat to look like it has been bitten by a rat. The ulcers do not cause any pain and are not itchy. 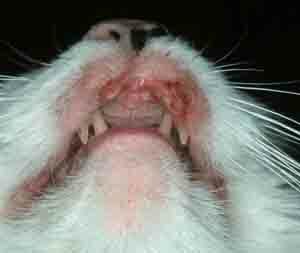 Eosinophilic granuloma on the lips of a cat. Called eosinophilic or linear granulomas, or true granulomas. These types of feline granulomas are found in younger femaile cats. Lesions tend to be located on the back of the hind legs in a straight line up the leg. These types of granulomas can also be found on the ear, footpad, paws and on the bridge of the nose. They are similar in appearance to bacterial or fungal infection, tumors and foreign bodies that enter the skin, so a veterinariain will look at all of these potential causes of the cat skin disorders under investigation before making a specific diagnosis. 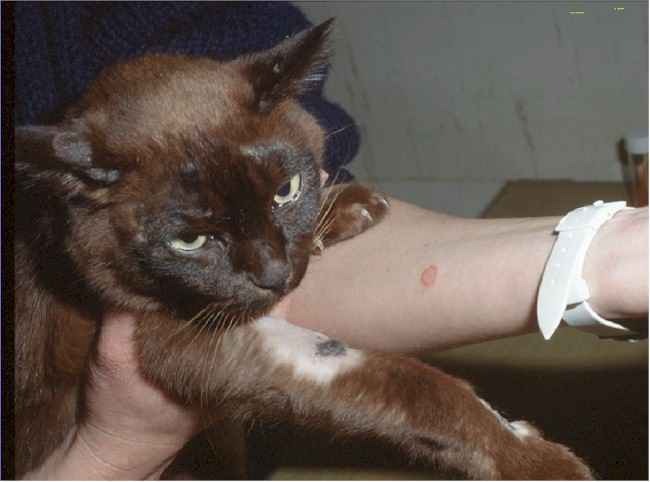 These types of lesions are sometimes associated with feline immunodeficiency virus and feline leukemia virus.